Robot Fish Toys. Fish toys and games have evolved through time—from plush toys, board games, online games and now, even robots! Robot fish toys have not risen into popularity yet, as children would prefer to own robot toys that resemble their favorite cartoon characters or domesticated pets such as dogs and cats. In reality, robot toys were already present a long time ago, after being created in Japan. The first robotic toy that emerged from 1930 to 1940 is assumed to be Robot Lilliput, a yellow, boxy-clockwork from Japan. The next Japanese-popularized robot released in the 1940’s was the Atomic Robot Man. It was distributed as a promo item in the New York Sci-fi conference a decade after. Fish robots are usually known to be used in researches and not many toy makers opt to design such toys. In 2008, however, another Japanese robot toy with fishing concept surfaced into the market, courtesy of the Nakajima toy company. “Dynamic Fishing”, as it is called, is an unconventional toy which targets adult gamers and hobbyists. It was introduced to the public during the 2008 Tokyo Toy Show and was said to be made for enthusiastic bass hunters. Nakajima said playing with this 22.5cm-long robotic creature is a good practice for a real-life bass hunting. The Dynamic Fishing kit comes with a lure, an angling rod, and the bass robot. Once you put the fish in an aquarium or bathtub, it starts to swim automatically. It also moves its mouth like a real bass and flounders when caught in the bait. The set is mainly available in Japan for $27 plus the shipping fee. However, interested buyers outside Japan can buy the toy from Amazon through Amazon.com in Japan. 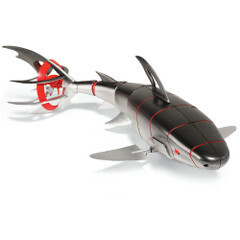 Another robo fish that’s splashing its way into kids’ hearts is the Remote Controlled Robotic Shark toy. The plaything comes in two variants: the Hammerhead and the Bull Shark. This one-of-a-kind robotic shark toy has a full-variety of motions that duplicate the smooth and sleek movement of the sea predator. It can elegantly move up-down, left-right and even backwards in the water. It can go under the water up to 9 feet and swim 40 feet away from its submersible remote control. It is powered through a 9-volt battery and has a run time of 15 minutes. The battery should be charged 4 hours during the initial charging and requires an hour thereafter. The robotic toy is available through HAMMACHER SCHLEMMER for $69.95. It also comes in three colors (blue, red and black); each [color] has different sensors allowing three different sharks to swim simultaneously. The toy is ideal for children 8 years old and above who love water adventures and sea creatures. There are actually not many robot fish toys available for children at present. These toys may be limited in the market now, but who knows? There might be a greater quantity and more complex sea creatures swimming around for entertainment and learning for the future generations. I know I want a robo-shark for MY next pool party!